Anchor: A local research team has assessed that nearly 12-thousand people die prematurely annually due to fine dust. Bae Joo-yon has the details. Report: The Seoul National University research team analyzed the level of ultrafine dust, life expectancy and duration of life by region in South Korea. Its findings estimate that in 2015 alone, around eleven-thousand-900 people are likely to have died earlier than expected due to the ultrafine dust nanoparticles. Ultrafine dust has been classified as a group one carcinogen by the World Health Organization(WHO). The annual average dust concentration in South Korea is about 25 micrograms per cubic meter, more than double the WHO recommendation of ten micrograms. 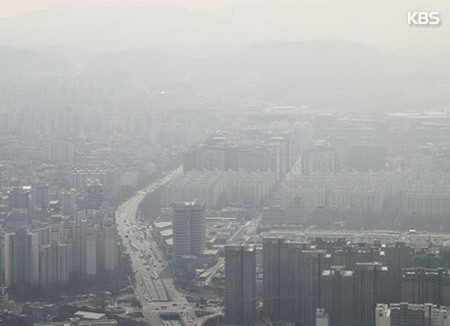 Professor Hong Yoon-chul of SNU College of Medicine says the study shows that if fine dust levels are slashed to the level deemed appropriate by the WHO, the number of premature deaths resulting from fine dust could be reduced by some eight-thousand a year. "Rather than causing an abrupt death, it will bring about accumulative effects. So it will come faster than normal deaths by a couple of years." Researchers also classified the number of premature deaths due to fine dust by disease. The number one cause was cerebral apoplexy, a form of stroke, which accounted for about half of the deaths. The second cause was heart disease, followed by lung cancer. The latest study results are the first officially-recognized statistics to use WHO authorization methods. The results will be published in the July edition of the Journal of Korean Medical Science and will be used in devising policies at the health and environment ministries. Bae Joo-yon, KBS World Radio News.